The history of the club using actual reports from the Washington Post. 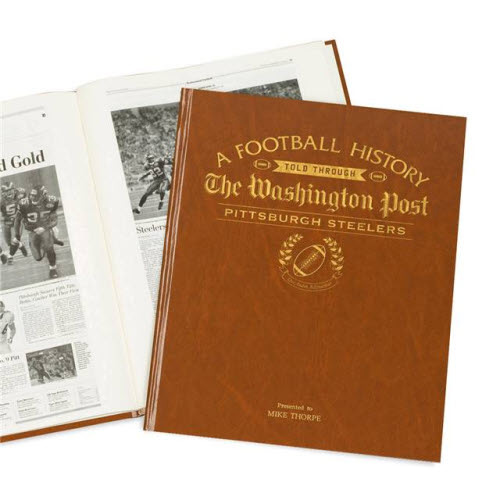 Capture the history and greatest moments of the Pittsburgh Steelers through Washington Post newspaper articles written at the time. This book covers many triumphs starting in October 1942 with the Steelersï¾’ unexpected 13-10 victory over the New York Giants. From their 4 Super Bowl victories in the 70s, to more recent victories, each memorable moment of Steelersï¾’ history is documented in this commemorative book. You can view the contents of the book here, click on this link (PDF file, opens in new window, opens in new window).